Kent is an old racing buddy of the Vorshlag crew and volunteered to help us develop AST shocks/struts for the S197 Mustang chassis. This car has prototype AST 4100/4200 shocks, Vorshlag camber plates, and Hyperco springs. Kent runs National level events and was 2nd fastest on day 1 of the 2008 SCCA Solo Nats in FStock. 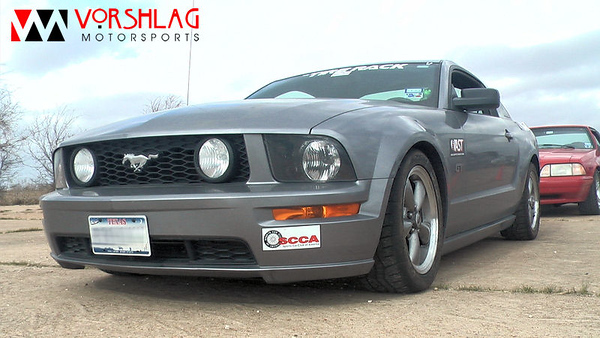 His GT is being prepped for the STU autocross class (the first serious STU attempt by any Mustang) and if that doesn't work out it will go straight to ESP. Kent's Mustang at the Feb 2009 TAMSCC autocross, sporting some "vintage" Falken RT615 tires on stock wheels. This car has prototype AST 4100/4200 shocks, Vorshlag camber plates, and Hyperco springs.